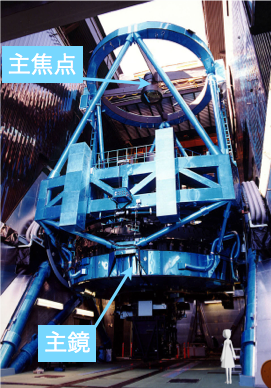 Subaru telescope has the unique prime focus (主焦点) located 15 m above the primary mirror (主鏡) The prime focus provides us with the wide field of view that covers the entire moon at the same time. In 1999, our group had developed a Prime Focus Camera, Suprime-Cam. Thanks to the Subaru's mechanical stability and accurately adjusted optics as well as superb seeing on Mauna Kea, sharp images were realized over the entire field of view. Wide field and sharp camera on a large aperture telescope had been unique and enables many new discoveries. About ten years have passed after the first light of the camera. Since then, great progress have been made in understanding galaxy formations in early universe whereas new mysteries emerge such as dark energy. It turns out that the performance of Suprime-Cam is not enough to tackle with these new themes in observational astronomy. In the mean time, advances of manufacturing technologies in semiconductor and optics industries enables large format sensors and lens that are crucial for building larger astronomical camera. Therefore, we decided to build Hyper Suprime-Cam in 2002 whose field of view is seven times wider than that of Suprime-Cam. Year Milestone, Progress Budget, Organization People Org.